has made more than 400 repairs on the lines that join Europe and America. He tells the romance of laying cables and the strenuous jobs of mending them. Adventures of men engaged in this unusual work. A man in Great Winchester Street, London, touches an electric key, and in LaSalle Street, Chicago, a tiny glass finger writes on a moving tape a curious zigzag line. This line is a message coming over one of the longest cable circuits in the world. In distance, as the cablegram travels, LaSalle Street is five thousand five hundred miles from Great Winchester Street; but in time it is just across the way. Within one thousandth of a second the electric impulse, started in London, has reached Chicago. The sending machine clicks like a typewriter at the office rush hour, but the moving finger is as noiseless as the most delicate fountain pen. Translated, the line of hieroglyphs it writes in thin blue ink may be the findings of an international conference settling the affairs of nations; or perhaps it is only the appeal of some stranded tourist in Paris for enough money to pay for his passage home. Sometimes the message is a desperate cry for help. One winter night the siphon recorder in the Western Union cable office on Broad Street, New York, began to write: “Is there a doctor near you?” The station in Placentia, Newfoundland, was calling. The sender explained that he must have medical advice at once. His infant daughter had been taken dangerously sick, and the doctor was away. It was midnight. Broad Street was deserted; but the operator remembered that a telegraph office in the vicinity employed several medical students, who were earning their way through college by telegraph work at night. He called that office and found one of the students on duty. It took only a few seconds to put the young man on the cable. The anxious father in Newfoundland described the baby’s symptoms. Another moment, and a prescription began to go over the wire. The medical man stayed on the case that night until he got word from Newfoundland that his patient was better. Then he went back to his telegraph job, happy in the thought that his skill had stretched along a thin copper wire over land and under sea to help a fellow mortal a thousand miles away. The submarine cable is more than just another scientific marvel. It combines with the magic of electricity the tang and mystery of the sea. Between the sending station and the receiving station is a whole world in itself, a world of submerged continents, peaks, and valleys, whose only known highways are the slender lines of ocean cable. It is now sixty-seven years since Cyrus W. Field sailed from Valentia, Ireland, with the first cable to be laid in the Atlantic; and it was not until nine years later that he succeeded in putting across a cable that would “cable.” The feeble Atlantic telegraph of that day has multiplied until now there are nineteen submarine lines connecting Europe and North America, besides the hundreds that join other continents and islands. 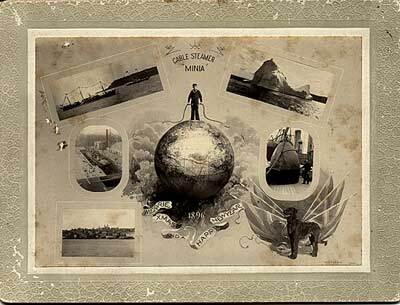 Altogether, more than 325,000 miles of telegraph wires traverse the ocean floors of the world. From the first heartbreaking experience of Field and his associates to the present day cable history is one long story of fighting the sea. Cable ships are kept constantly busy lifting submarine telegraph lines from their vast depths, splicing breaks, cutting out kinks, or repairing tiny cracks through which the water leaks in and the electricity leaks out. Halifax, Nova Scotia, is headquarters for the cable repair service from the American side. Sixteen of the nineteen transatlantic cables come in at Newfoundland, as that is the point of America nearest to Europe, and Halifax offers a nearby harbor to the repair ships. Captain W.G.S. deCarteret, veteran of thirty-five years’ experience in the submarine cable service, has made more than four hundred repairs on the lines that lie at the bottom of the Atlantic Ocean. He is now marine superintendent of the Western Union cable depot at Halifax, Nova Scotia. It was in Halifax that I met and talked with Captain W.G.S. 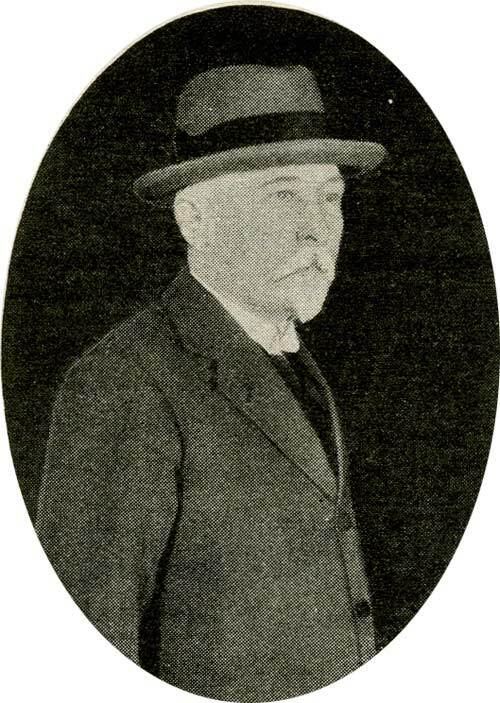 deCarteret, who has been in the cable repair service for upward of thirty years. 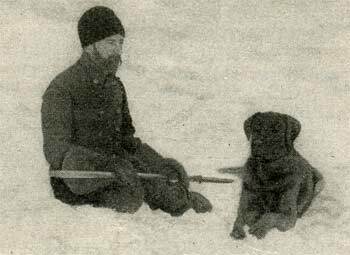 He has braved the worst gales of the North Atlantic; has nosed through the dangerous fog banks off the Newfoundland coast; has fought with icebergs, and has rammed his ship through great ice fields to get to his cables. I hadn’t long talked with Captain deCarteret before I was sure that this estimate of him was correct. He spoke of the ocean floor as another man would talk of a landscape. “But tell me, Captain” I said, “how in the world can you drop a hook in water three miles deep and pick up a line that isn’t any bigger than my thumb!” “Oh, that’s easy” he answered. “Comparatively easy, I mean. Our charts tell us where the cable lies. By testing from shore for resistance, the electrician knows how many miles out the fault has occurred. All we have to do is to steam out to location, let a grapnel down to the bottom, and steam back and forth across the charted position till one of the grapnel prongs catches. We can tell when, for the dynamometer, with which the grapnel rope is connected, immediately shows an increased strain. “It isn’t always the cable, however, which causes the strain. One of our ships, in dragging for the Barbados cable off the West Indies, brought up a piece of battered teakwood that looked like part of an old Spanish ship. Another time in tropical waters, I hooked an immense crust of coral and came near losing my grapnel in the strain. Sometimes the prong catches under a rocky ledge or in a crater; then, of course, the grapnel is lost, unless an under-sea current or something of the sort releases it. But usually it’s the cable that is hooked. And then the real job begins - the lifting of it. “It would if we tried to pick it up near the break,” explained Captain deCarteret. “We move along five or six miles - far enough to give sufficient counterweight - before attempting to hook in again. If we succeed in lifting the cable, we simply cut out the five or six miles, splice in the new cable, and pay out enough to cover the ground between the point of lifting and the position of the break. Finally, we attach a buoy, and lower it into the sea. “Then we find the other end of the break, and repeat the process I have just described. Before we join the two ends, however, we test each section to shore to make sure that it is signaling. After making the final splice, we wait a few moments for a wireless message from one of the stations saying that the cable is working satisfactorily. Then we drop the whole thing back into the sea, and call it a finished job. “Every repair job presents a fresh problem,” the captain went on. “Conditions of the cable, weather, and ocean depth are rarely the same in any two cases. Sometimes, in heavy weather, we lose grapnels and rope; buoys drift and founder, or they get fouled in cables and do serious damage. Grapnel rope costs $1,200 a mile; a deep-sea buoy, which carries six tons, costs over $2,000, and a mark buoy of three tons, $900. So, you see, when we lose twenty-eight miles of rope and half a dozen buoys, as we did on one repair, our expense in these two items alone is considerable. But the expense is not the worst of it: if supplies give out, we must lose valuable time putting back to port for a fresh stock. “Occasionally, we have interesting complications to deal with,” said Captain deCarteret, smiling. “On one repair off the coast of Newfoundland, we hooked the cable, began to lift it, and found the weight enormous. The dynamometer, which should have shown a strain around two tons, was dangling up into infinity. We couldn’t understand it. 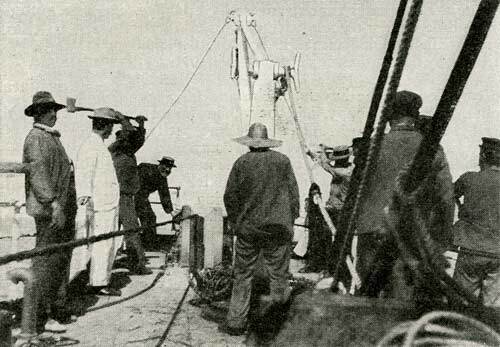 But the grapnel held and the hoist continued to lift, and presently up came the cable–with a whale on it! “It was a sixty-foot whale, that was looped in that cable as neatly as any bosun’s mate could have done the job. The cable passed through his mouth and over his back, where it crossed another diagonal of cable, which was looped and crossed over its tail. If a man had been sent down to put a rope around the whale to lift him, that is just the way he would have adjusted the rope. Captain deCarteret disclaims any experiences with sea serpents, octopuses, or other ocean monsters, real or imaginary. “I’ve heard of cables in southern waters being bitten by sharks,” he said. “Indeed, one was pulled up, I understand, with a shark’s tooth imbedded. I’ve heard, too, of a captain who reported lifting a cable off the coast of Spain recently, and having to remove two tons of oysters before he could proceed with the repair. In the Western Union offices in New York is a section of cable containing a minute puncture made by one of these tiny sea creatures. It is kept in the cable engineer’s office as a memento of a repair that cost over one hundred thousand dollars! That’s how much damage an ocean “wiggletail” may do. An ocean cable consists of a copper center imbedded in gutta-percha with sheathings of linen tape, jute, and steel wire, and an outer coat of some tarry compound. As an additional safeguard against the teredo, manufacturers now wrap the gutta-percha core with a spiral of brass tape. Near the shore, where the cable is subjected to chafing through the movement of tide and surf, the armoring is extra heavy and the cable may measure three or four inches in diameter. In deep sea sections it is rarely more than an inch. All of these coverings are to protect the copper center, which in bulk may represent only one tenth, sometimes only one twentieth, of the cable diameter. Though it is a single conductor, this copper center is customarily made of several strands of fine wire, to give flexibility and to provide against a broken circuit. If one wire snaps there are others on the job. 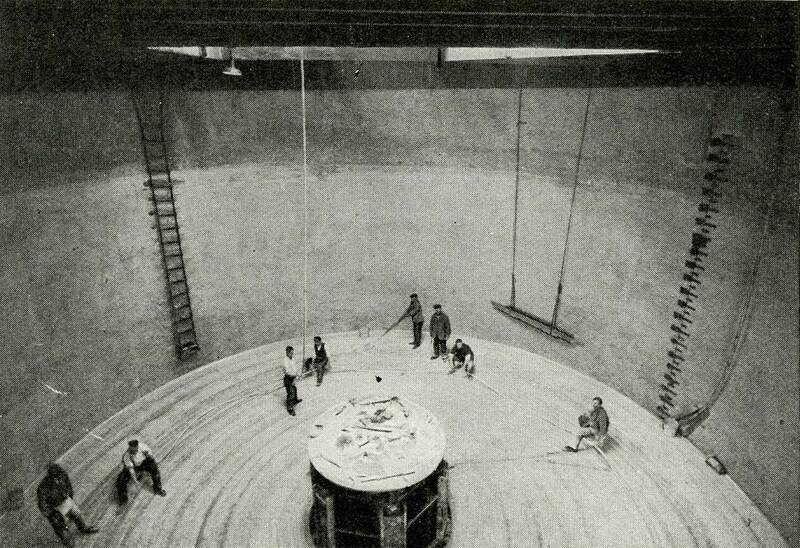 Coiling a cable into one of the tanks of the Colonia. As soon as the cable is made in the factory it is coiled and submerged in great tanks of water. When it is transferred to the cable ship, it is immediately submerged in similar tanks on the vessel. The Colonia, the largest cable ship in the world, can carry three thousand miles of cable in her tanks. Repair ships, like the Lord Kelvin, may carry three hundred miles for use in mending breaks. Sheaves for paying out the cable are at the bow end of the ship. Here, too, are the dynamometer, which registers the strain, and various apparatus for laying or lifting. As it is being laid, the cable comes out of the tank, passes through a series of wheels or pulleys, and over the bow into the water. Sharp watch is kept on the line at every stage of the process, for if a kink develops it is almost certain to break the gutta-percha insulation, and thus fault the cable before it is laid. “While paying out in mid-Atlantic,” said Captain deCarteret, “one of our seamen saw the cable curl as it came out of the tank, and jumped forward to straighten it. It coiled over him, tightened, and instantly he found himself bound. Men at the tank gave the danger bell, and the paying-out gear was stopped before the three-ton strain could come into action on the man’s body. It would have cut him in two. The great danger in laying a cable, as in lifting it, comes from the immense strain caused by its own weight. The speed of the ship and that of the paying out gear must be closely coordinated. If the cable is payed out much faster than the ship moves, too much slack is given, and the cable sinks to the bottom in spirals. At the first strain, these spirals are likely to form kinks, and crack the core. If the cable is payed out too slowly for the speed of the ship undue strain is put upon it, and it breaks. The cable must be free from undue strain also when it rests in the sea. To suspend it between two submerged peaks is simply to invite trouble. So it is laid with enough slack to lie flat along the bottom. If an airplane should lay a line between New York and San Francisco, the rope would curve over the hills, climb the mountains, lie flat in the valleys, and sink to the bottom of the lakes and rivers. Similarly, the line which the cable ship drops follows the ups and downs of the ocean bed with enough slack to allow it to be flat along the bottom. When you drop something into two or three miles of ocean, you immediately invite hard usage. First, there is the pressure of the water. The weight of the sea at 1,000 fathoms (approximately one mile) is one ton to the square inch, or 150 times as great as the air which we breathe. Go down 2,500 fathoms and there is a pressure many times more powerful than that of the steam in a locomotive boiler. Captain deCarteret told me of a test that was made on the cable ship Colonia in mid ocean. An empty soda water bottle–one of the kind that has a conical bottom–was fitted with a long stopper of hard wood trimmed to fit the neck of the bottle snugly, and cut so as to make it barely touch the bottom of the bottle. The bottle was weighted and let down to a depth of 2,000 fathoms. When it was brought up, the point of the wooden stopper was protruding through the thick glass bottom. The pressure of the water had converted the stopper into a hydraulic ram, and had driven it so neatly through the bottom of the bottle that there wasn’t even a star fracture in the glass. Another cable seaman told of lowering a piece of meat, properly weighted to make it sink, in the mid-Atlantic. After being exposed to the near-freezing temperature and the squeezing weight of a thousand fathoms of ocean, that tough roast beef came up as tender as veal. Even with every precaution, the cable is so vulnerable and its operation so sensitive, that a cable company counts on having a certain average of trouble. Out of six or seven cables, there is usually one that needs repairs. “The causes of cable trouble are numerous,” said Captain deCarteret, “and most of them are quite commonplace. It is only occasionally that we get a whale, and since the manufacturers have been sheathing the cable core in brass it is a rare occasion to find a teredo or other animalculae. “The most prolific sources of trouble are anchors and trawlers. We have an agreement with the Newfoundland fishermen that when their anchors foul in a cable we will reimburse them if they will cut the rope anchor adrift. Rum runners have recently added to our troubles by dragging their anchors into cables. Icebergs are only a part of the story. More hazardous are the great fields of floating ice which in the early spring drift down from Baffin Bay and cover the cable region with a vast semi-solid area of Arctic ice. When a cable fault occurs here, the cable captain has a job on his hands that combines the difficulties of a repair with many of the problems of a polar expedition. “On one occasion a cable got into trouble some distance out from Sydney, Cape Breton Island,” said Captain deCarteret, “and I went out to make the repair. We had to ram our way through three hundred and fifty miles of ice to reach location. It was a question, once we got there, how we could grapple for a cable in that pack, to say nothing of the problem of getting out again after the ice drift had closed us in. It is not always possible to ram through the ice fields. “Sometimes, ” said Captain deCarteret, “the ship can only wait, hemmed in by a floating ice pack that is just short of being solid, and drift with the ice, trusting for a change in the current or the wind to part the floe and give an opening. 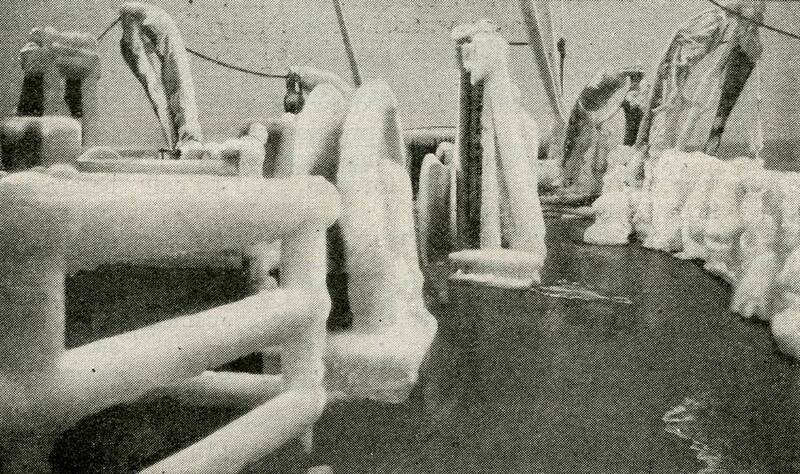 In steaming through heavy ice there is danger of breaking the propellers, thus rendering the ship helpless. Worse still, there is always a possibility that the ice will jam, and crush the vessel. One of the staunchest craft on the Atlantic today is the new cable ship, the Lord Kelvin, which was made with an unusual strengthening of frames and plating of hull to enable her to batter her way through northern icefields. On more than one occasion, the Lord Kelvin has actually climbed the slopes of an ice pack and let her weight crush the ice barrier. “Icebergs and ice fields, like anchors and trawlers, usually cause trouble near the shore, where the cables lie in comparatively shallow depths. Out in mid-ocean, about the only destructive factors are volcanic action and just ordinary wear and tear. “I’ve never encountered any active volcanos under the sea,” said the captain, “though I have grappled for cable in a burnt out crater. Some of the cable accidents which have been attributed to earthquakes can be accounted for, in my opinion, by coral projections and other natural undersea growths. “There are, however, undoubtedly occasional submarine shiftings of the earth’s crust. Recently a British company found that its cable from St. Helena to Cape Town, which had been proved by soundings in 1899 to lie at a certain point on a bottom three miles deep, had been raised at this point to a depth of only three fourths of a mile, and broken. That looks like the action of an undersea earthquake or other volcanic movement. “A few years ago a fault occurred for the first time in the most northern of our cables, which happens also to be the oldest active trans-Atlantic cable. While grappling on this repair, we located a volcanic region of high scraggy hills and a great many deep ravines and steep cliffs, with a central crater containing volcanic glass, brown umber, and yellow umber or ochre. At one place a difference in depth of 1,130 fathoms (6,780 feet) showed within an area of three miles. Men grow gray quickly in the cable repair service. A passenger ship or a freighter travels on a fairly definite schedule; its officers and crew know that they can count on being in port within a given time. But the cable ship goes out, and it may be a month, or three months, or more, before its crew sees land again. Foul weather comes up, and in order not to lose time from ,the repair, the cable ship stays out on the sea, rides the storm through, sticks on its job until either the repair is made or the supplies are gone. “The best time of the year to make repairs is in April, May, and June,” said Captain deCarteret, “for then the winter gales are over and the summer gales have not yet set in. During this favorable season a cable captain usually starts work at two o’clock in the morning. That is the usual time, for if you begin lowering the grapnel at two, and all goes well, you may hook the cable by six. “Of course it is only occasionally that all goes well. Sometimes the cable is out of position and we have to hunt for it. I’ve found a cable as much as seven miles off its charted position. A transatlantic cable represents an initial investment of about three million dollars; but that is only its first cost. A single deep-sea repair may cost a quarter of a million dollars. It takes two hundred thousand dollars a year to maintain the cable ship Kelvin alone, and in hard years this may run up to fifty per cent more. Cable engineering has been making rapid advances in recent years and traffic has grown, with the result that cable rates are now lower than they have ever been. Prior to 1915, the minimum rate between New York and London was twenty-five cents a word; now, for an even speedier service, the rate is twenty cents a word. For night letters the rate figures as low as five cents a word. In 1866, when the Atlantic Telegraph first opened, the minimum charge was one hundred dollars for twenty words. Every transatlantic cable is operated duplex; that is, while a message is being sent in one direction, another is passing in the other direction. Practically, therefore, the nineteen cables between Europe and America are the equivalent of thirty-eight. The speed of transmission between London and New York or Chicago is 245 letters per minute, an average of 24½ words, and the cables are operating twenty hours out of every twenty-four. The Dawes Report to the Reparations Commission, sent from Paris through London to New York on April 8th, 1924, is the longest message ever cabled. In transmitting it, 39,727 words were shot under the Atlantic in eight hours. The latest advance in cable development is represented by the new line laid in the fall of 1924 between the United States and Italy, via the Azores. This cable has a special type of conductor, known as the permalloy or loaded conductor, which gives it a speed four times as great as that of the old type. Had the Dawes Report been carried by this cable, it could have come through in two hours. Here’s an interesting story about one of Captain deCarteret’s earlier experiences, from the Halifax (Nova Scotia) Chronicle-Herald published 18 April 1912. Although the Minia (a cable ship owned by Western Union) was too far away to search for Titanic survivors, on a subsequent trip to recover bodies it also picked up a number of artifacts, now in museums in Nova Scotia. Was Never Within Four Hundred Miles Of The Scene Of The Wreck. Had News Of Disaster Through Intercepted Wireless Messages. The Mackay-Bennett Sails To Endeavor To Recover Bodies - Wagon Loads Of Caskets Seen On The Streets. The hope that any of the two thousand missing passengers of the ill-fated White Star liner Titanic had been rescued by the Allan liners Virginian or Parisian, or the cable steamer Minia, was abandoned this morning when the cable ship groped her way through the dense fog off this port and steamed slowly up the harbor warping into her berth at Central wharf. A representative of The Evening Mail was the first to board the steamer after she reached her dock and at once interviewed Captain DeCarteret. The commander of the Minia had no information of importance to give regarding the disaster, in fact, he was never within four hundred miles of the scene of the wreck, and the only news he had was from intercepted messages from the great ocean liners and the wireless stations. The commander of the Minia received his first information of the disaster by cable from Cape Race. 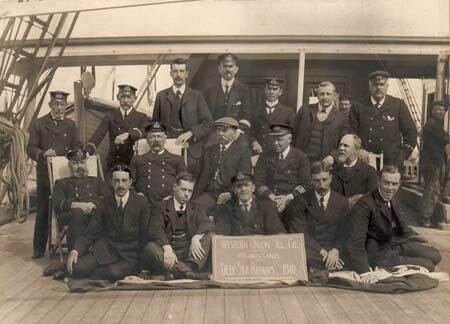 The Minia was then off the Newfoundland banks on a repairing trip. The message stated that the Titanic had struck an iceburg off Cape Race about 150 miles distance from the Minia. As soon as this information was received, Captain DeCarteret ordered work to be stopped and called all the boats in, but no sooner was this task accomplished than the wireless operator on the ship caught a message that had been flashed through the heavens by one of the liners giving the position of the accident as four hundred miles from where the Minia had been repairing. Captain DeCarteret realized that owing to the fact that he would have to steam through at least one hundred miles of heavy ice, it was folly for him to attempt to go to the steamer’s aid, as it would at least be three days, and owing to the fog possibly four, before he could reach the scene. Repairs were again started, and after the work was completed the Minia steamed for Halifax, bringing no news of the disaster. Captain DeCarteret is of the opinion that if the Titanic went down, as there seems to be no doubt she did, that it is hardly possible for any of the bodies to come to the surface owing to the great depth of water.